Madina, 10, was collecting firewood in Afghanistan when a roadside bomb went off. 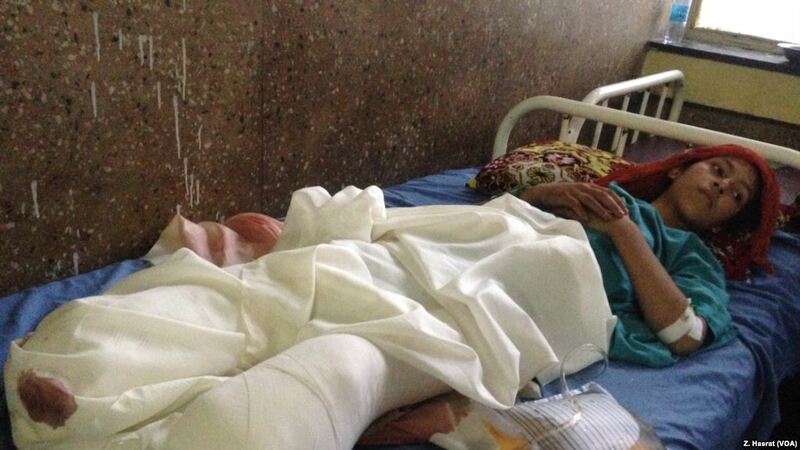 She is being treated in a hospital in eastern Jalalabad city, and doctors say she is in stable condition. WASHINGTON/NANGARHAR, AFGHANISTAN — Ten-year-old Madina was collecting firewood with her friends Thursday in eastern Afghanistan when a roadside bomb went off and seriously injured her. “We were on a hill close to my home, collecting firewood, when I heard a loud sound underneath my feet,” she said from her hospital bed in eastern Jalalabad city, where she is being treated. Madina’s wounds highlight the growing number of civilian injuries and deaths due to violence in Afghanistan, according to a midyear report by the United Nations Assistance Mission in Afghanistan (UNAMA). UNAMA said 1,662 civilians have been killed during the first six months of 2017 as a result of suicide attacks, roadside bombs and the government’s ongoing crackdown on militants across the country. Another 3,581 civilians have been injured during the same period, according to UNAMA. The U.N. blames Taliban, IS and other armed militant groups for the majority of the civilian casualties. Amnesty International has denounced attacks on civilians, charging that it constitutes a war crime, and demanded the Afghan government ensure the safety and protection of its citizens. “A record number of civilians have been killed in the first half of this year, with women and children being the worst affected. And neither the Afghan government nor the international community is paying enough attention to their plight,” the rights group said. UNAMA, too, warned anti-government forces not to deliberately target civilians. “UNAMA reminds anti-government elements that employment as a civil servant tasked with providing public services to Afghan citizens on behalf of the government is a civilian function. Attacks deliberately targeting civilians, and the intentional killing of civilians, are war crimes,” UNAMA said following Monday’s suicide attack. Doctors said Madina, who lost both legs in the blast, is in stable condition and will eventually receive prosthetic limbs. However, the explosion has changed Madina’s life forever, and she is having trouble understanding the severity of her injuries. “I want the hospital to fix my legs,” she said. The incident took place in eastern Nangarhar’s Sangena district. Family members claim the roadside bomb was planted by Islamic State (IS) militants in the region. Madina’s grandmother, who asked not to be named for security reasons, told VOA that IS militants have planted mines in the region. “IS militants came to our village and implanted mines,” Madina’s grandmother said, adding that Madina was the only family member who helped her father with household errands. Hazrat Hussain Mashreqiwal, spokesperson for the Nangarhar police chief, told VOA that Taliban and IS militants are responsible for planting roadside bombs in the region — targeting one another, as well as civilians. The increase in roadside bomb blasts has taken a toll on civilians, not only in eastern Nangarhar province, but across Afghanistan, according to officials. Civilians are increasingly bearing the brunt of the ongoing war in Afghanistan, whether it be from roadside bombs, Taliban suicide attacks or government operations, rights groups say. On Monday, a Taliban suicide car bombing killed at least 35 people and injured dozens more in the Afghan capital, Kabul, security officials said. Taliban claimed responsibility for the attack, saying its bomber targeted two minibuses carrying personnel of the Afghan intelligence agency, or NDS. But a Kabul police spokesman told VOA the victims were mostly employees of the ministry of mining and petroleum industry. The blast took place while the bus was passing through a crowded marketplace, killing shopkeepers and passersby, according to eyewitnesses at the scene. In late May, a truck bomb hit the diplomatic area of the Afghan capital, killing at least 90 people and injuring more than 350, all of them civilians. Taliban denied responsibility for that attack. Analysts theorize that Taliban militants tend not to claim responsibility for attacks that have high civilian death tolls. Mohammad Habibzada of VOA Afghanistan service contributed to this report.